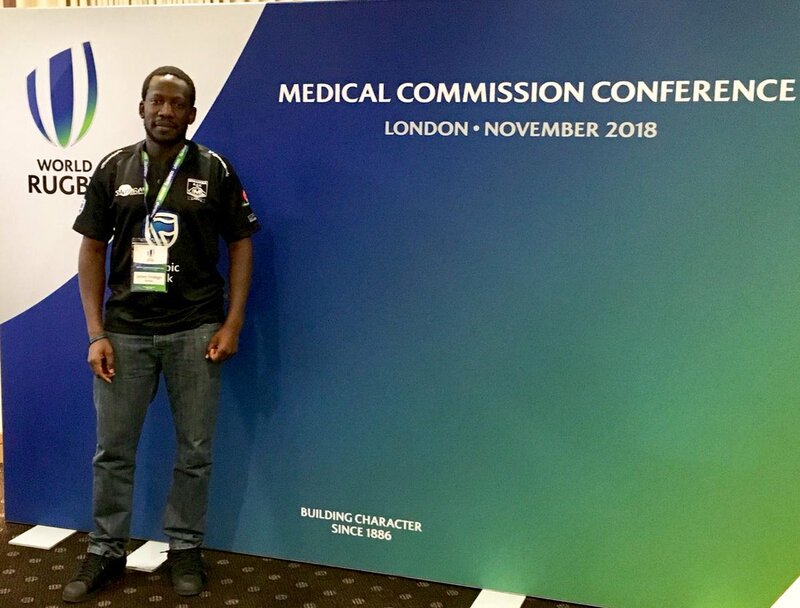 Dr.James Ondiege is in London to represent Kenya at the ongoing World Rugby Medical Commission Conference. World Rugby says injury-prevention and player load in elite rugby will top a packed agenda at the World Rugby Medical Commission Conference in London on 1-2 November, 2018. In its 10th edition, the conference will bring together a host of experts from a range of medical disciplines to present and share the latest research, practice and industry learnings on a range of topics including concussion prevention, reducing injury-risk and training load management. Dr. Ondiege, nominated by Kenya Rugby Union, got his Immediate Care In Rugby Level 2 Accreditation early this year and as it stands, he is the only Doctor with this level of Accreditation in the Country. He has been the Match Day Doctor during this year’s Rugby Africa Gold Cup matches. Global tournament player welfare standards and mandatory medical education and accreditation, the Head Injury Assessment programme, which has revolutionised standards of concussion identification and removal in elite rugby among others. Speakers at the conference include research experts, leading sports medicine consultants, international players representatives, education and implementation experts. In line with the core theme of injury-prevention, the programme includes the latest learnings from World Rugby’s research-based three-phase approach to changing player behaviour in the tackle. The high tackle warning system resulted in a 50 per cent reduction in concussions at the World Rugby U20 Championship 2018. As part of World Rugby constant quest to improve player welfare, there are also sessions on player load management and guidance for elite coaches and injury-prevention education.